In early 2017, shortly after the inauguration of Donald Trump, the rumor began to spread that Facebook founder Mark Zuckerberg himself was planning to enter the presidential race in 2020. This rumor is only a symptom of the general lack of understanding of our times. For Mark Zuckerberg has long been a politician. He has an enormous impact on the daily lives of two billion people. He makes decisions that affect how these people get together, how they interact, even how they see the world. So Zuckerberg is already perhaps the most powerful politician in the world. Any job in traditional politics, including the office of US president, would be a step down. In this text, I will try to determine and analyze the ways in which platforms act politically, examining how they organize their power base and in which fields their policies are already changing the world. But first we should eliminate three fundamental misconceptions about platform politics. When we talk about “platform politics” or platform regulation, we tend to think of platforms as the subjects of regulation and policymaking. That isn’t wrong as such, but it conceals the far more important point that today, the platforms themselves have become influential regulators and political actors. Platforms provide the infrastructure for our digital coexistence – with an emphasis on “structure”. For this structure is neither arbitrary nor neutral: Defining the structure of communication is a political act in and of itself, one that enables certain interactions and reduces the likelihood of other kinds of communication. This is a profound intervention into our social lives, and therefore in itself political. So it makes sense to think about platforms not merely as companies that provide Internet services, but as political entities or even institutions.2 Their impact on the political debate, on our society and coexistence, and therefore on all kinds of political decisions, is nothing short of the influence of traditional media. Platforms can be regarded as the Fifth Estate. But unlike the other four estates, platforms are not limited by the boundaries of the nation state; they act and think globally by design. And in contrast to other institutions, they don’t try to overemphasize their socio-political significance; after all, political responsibility is bad for business. Platforms rather tend to downplay their political power and refuse to take responsibility. They are political actors in spite of themselves. One reason why platforms are still not taken seriously as political actors is the general lack of understanding of their power dynamics. When politicians come up against platforms, they like to throw the weight of their political legitimation around. They talk about the “primacy of politics”, as if to convince themselves and others of their agency. This primacy is derived from the fact that the politician came into office by way of a sovereign, collective decision. But platforms, too, generate a kind of legitimation through collective decision-making, even though this works slightly differently. In his book Network Power, David Singh Grewal argues that the adoption of standards can be understood as a collective decision.3 And standards are but the conditions of possible interactions, which is why the social relevance of every decision for or against a standard is inherent political. The mere fact that these decisions are not all taken simultaneously as they would be in an election, but rather in staggered intervals (“aggregated”), does not diminish their social impact. The power of these aggregated, collective decisions is nothing new. It relates to the languages we speak, the manners we cultivate or accept, and of course, to the choice of network service we choose to use. In the end, we join Facebook not because of its great product quality, but because all our friends are on Facebook. In economics, this phenomenon is called the “network effect”, but Grewal is quite right to view it as a political power factor in its own right. Once a certain standard is widely established, the pressure on the individual becomes so great that there is little choice but to adopt that standard as well – the alternative often being social ostracism. We accept the “network power” that these standards wield, because ultimately they can never be enforced by individuals. At least that applies to open standards. No one can prevent me from learning Russian, or from making a server available on the Internet with open protocols like TCP/IP. Social pressure always comes from the community as a whole, so it can never instrumentalized individually. Network power, however, becomes “platform power” when the standards adapted contain key mechanisms of exclusion. Facebook could withhold access to my friends at any time, or place temporal or local restrictions on it. On the one hand, access control of the standard is at the heart of the platform’s business model, on the other hand, it is the basis of its political power. To sum up: Platform Power = Network Power + Access Control. Of course, even in conventional politics it has become clear that platforms have this uncanny power, but since politicians don’t understand that power, they are simply making matters worse. They are under the misconception that dealing with Google, Facebook, Apple and Co is much the same thing as the corporate power structures they might have encountered at Siemens or at Deutsche Bank. And so they resort to the playbook of political regulation to match these powers. But platform providers are not just large enterprises; their power is based on more than just money and global expansion. Rather, the platform is facing down the nation state itself, as a systemic competitor – even if neither side is prepared to admit it yet. This is why all efforts in conventional politics to regulate platforms must lead to a paradox. Even while politicians are shaking their fists at Google and Facebook, they are granting these platforms more sovereignty by the minute. Any new constraints devised by policymakers just serve to strengthen the political power and legitimacy of the platform. One example is the European Court of Justice ruling on the so-called “right to be forgotten”, which forces Google to redact search results following a very vague list of criteria.4 Another example is the notorious Network Enforcement Act, recently introduced by the German Federal Minister of Justice Heiko Maas, which obliges Facebook and other platforms to delete what is deemed “obvious unlawful content”.5 In both cases, the state has relinquished its powers of jurisdiction and law enforcement to the platform in question. At first sight, this makes perfect sense, because platforms are the logical point of contact for regulating the digital world, thanks to their platform power and deep, data-driven insights. At the same time, this is fatal, because the state further increases the power of the platforms in this way, making itself dependent on its very competitors. The political influence of platforms takes many forms. I would like to examine three departments more closely where platforms are already very influential today and will gain even more influence in future (without this claiming to be an exhaustive list): domestic net policy, foreign net policy, and security net policy. 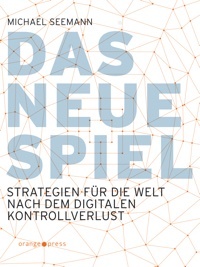 The term “net politics” (Netzpolitik) has become widespread, in the German-speaking net in particular, since it originated here with the popular political blog of the same name.6 The Netzpolitik site addresses topics like data protection, net neutrality, censorship and many other Internet-related areas of politics. It is important to regard the network as the subject of net politics in this case. For now, the term “domestic net policy” is merely intended to highlight the concession that these internal/external or object/subject relationships no longer exist – political issues pertaining to the net increasingly arise from within the net. Which implies that these issues can only be solved from within. This is not only pertinent to those problems with hate speech, trolling and fake news we are currently discussing, but also to older issues such as identity theft or doxxing (publishing personal information with malicious intent). Jared Cohen played a particularly pivotal role here.15 Cohen had joined the State Department while still under Condoleezza Rice, but rose to prominence during Clinton’s office. When in 2009, a revolution was threatening to break out in Iran, Cohen called Twitter and convinced them to postpone their scheduled maintenance downtime.16 Twitter played an important part in the coordination of the upheaval. Since the Snowden revelations of 2013 at the latest, relations between Silicon Valley and Washington have cooled down significantly. Platforms have since been trying to protect and distance themselves from state interference. This is mostly achieved through the increasing use of encrypted connections, and through elevated technical and legal security.18 In the US, this development in general, and the move towards more cryptographically secure systems in particular, is viewed with a mounting sense of discomfort. Beside these varied forms of cooperation and conflict between platforms and states, platform-platform relations should also be taken into account, of course.20 One politically tangible example is the fact that Facebook is increasingly losing users from the extreme right and right-wing spectrum to its competitor, VKontakte.21 VKontakte is the equivalent of Facebook in Russia, albeit with a completely different set of guidelines. For instance, while you might get into trouble for posting homophobic contents on Facebook, you might get into trouble on VKontakte for posting the Rainbow Flag. A segregation of society along the boundaries of different platforms and their according policies seems to be a plausible scenario, and may well provide a lot more material for foreign net policy in future. That said, the core misunderstanding here is the assumption that cyber-wars primarily take place between nation states. Even today, that is hardly the case. On the one hand, almost every “cyberattack” is an assault on a platform at the same time. The attack might pertain to the Microsoft operating system (as in the case of Stuxnet and many others), or to specific services (the attack on Google was directed at Gmail mailboxes, as was the Russian hack of John Podesta’s emails). Almost without exception, a software or service provided by a specific platform is involved. Further, many attacks are directed at platforms as their primary target. Perhaps the most prominent case is the 2015 attack from China on the GitHub developer platform. GitHub is a popular website where software developers can store and synchronize versions of their code and share with other users. Nearly all popular open source projects can be found there – including one called “The Great Fire”. The “Great Firewall” is what China’s powerful Internet censorship architecture is usually referred to, and accordingly, “The Great Fire” is a special toolkit designed to circumvent the Chinese firewall. Of course, the Chinese government didn’t find this at all agreeable. Finally, platforms are not only the target of cyber attacks, but more and more frequently the last line of defense for other targets. In 2016, a DDoS attack came down on the blog of security researcher Brian Krebs. His analysis of the attack revealed that the attack had been carried out mainly by Internet routers and security cameras. The underlying explanation was that a vulnerability in the operating system “Mirai”, commonly used in such devices, had allowed hackers to take over millions of these devices. It was the largest bot army the world had ever seen. So the inconvenient truth behind “cyber” is that it is not at all the state that is at the center of events, but the platforms. The platforms provide the infrastructure that comes under attack, and more importantly, they are increasingly becoming targets themselves. Most importantly, the platforms are the only players with sufficient technical capacity and human resources to fend off these kinds of attacks, or prevent them to save the day.29 Either way – if the worst comes to the worst, the state might have no choice but to slip under the umbrella of a welcoming platform, just like Brian Krebs did. “Cyber Sovereignty” on a state level still remains a pipe dream at present. Platforms are already holding a prominent position within the social order, which in itself is becoming more and more digitalized. Platforms regulate critical infrastructure for the whole of society, and provide protection and order on the Internet. Increasingly the platform is in direct competition with the state, which generates dependencies that could turn out to be a threat for nation states. In short: platforms need to become more like nation states, and states need to become more like platforms. In the meantime both sides, the state and the platform, don’t have much choice but to cultivate their mutually critical-cooperative relationships and collaborate in all three departments – domestic net policy, foreign net policy, and security net policy. It should be noted that competition between the two might even be advantageous for the citizen (or user) in the long run. While the state is trying to protect me from the overbearing access of the platforms, platform providers are trying to protect me from the excessive data collection of the state. Dieser Beitrag wurde unter Das Neue Spiel, english, extern, Kontrollverlust, Plattformpolitik veröffentlicht. Setze ein Lesezeichen auf den Permalink.